The Omega Fire Ministries, yesterday, denied that the General Overseer of the church, Apostle Johnson Suleman had a hands in the arrest and detention of Canada-based Nigerian Miss Stephanie Otobo by the police last Friday, March 3, 2017. 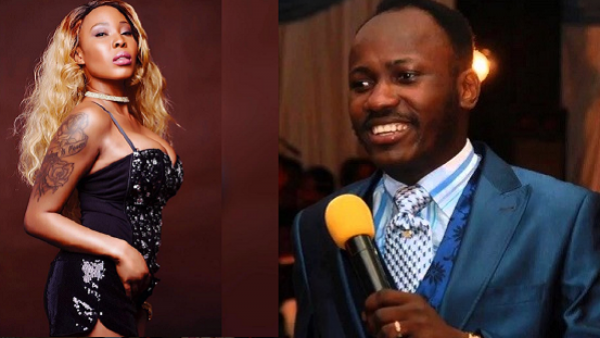 But Stephanie Otobo in a new video obtained by Saharareporters alleged that Apostle Johnson Suleman wanted her dead and that he pays the sum of four hundred thousand naira to any lady he sleeps with. Otobo said that she had an affair with Apostle John Suleman and he tried to kill her. Stephanie Otobo yesterday also released a series of raunchy screenshots of her videocam chats with Apostle Suleman as evidence to support her claims of a raunchy relationship with him.